In our Maths lessons we have been consolidating our knowledge of fractions and have recently moved onto percentages and seeing the relationship between the two. During our English lessons we have been researching the town of Whitby, where our guided reading book is based, in order to create a persuasive leaflet to attract visitors there. We have been looking at persuasive language and ways of encouraging people to visit. We are nearing the end of our guided reading book Room 13. It has been a very enjoyable book which has lead to a lot of discussion and speculation. For part of our topic we have made different types of mountains using modroc, a bandage like material which proved to be messy, now having painted them, they look really effective. We have thoroughly enjoyed learning how to play hockey and have now played several matches during the lessons. It has been very busy in Woodpecker's class during the past few weeks. We have started our new topic on Mountains and have found out how mountains are formed, we used all sorts of strange ingredients to demonstate the formation of the 5 types of mountains, such a s bread, rice crispy bars, balloons and sand. Our English lessons have been connected to our topic and we have studied reports on famous people who have been on expeditions to the summit of mountains, in particular Junko Tabei, who was the first woman to conquer Mount Everest. We have also written our own survival guides should we ever want to do the expeditions ourselves! In Maths we have been working on fractions using the four operations. Yesterday we completed 'Buddy's Workout.' This was our sponsored event for the NSPCC who have recently been in to talk to us,which involved doing circuits of the apparatus and mats in the hall without touching the ground, there were also circuits set up on the outside apparatus. Everyone enjoyed the day and hopefully we have raised a lot of money for this very worthwhile charity. In Guided Reading we have started the book Room 13 by Robert Swindells. As the title suggests, the book is centered around room 13 on a residential trip and what might be behind the door. There has been a lot of speculation within the class as to what this might be. Our music lessons have consisted of learning old school hip hop, in particular The Fresh Prince of Bel Air, which the children are really loving. Our new sports topic is hockey which the class is enjoying. We have been learning the basic skills in order to be able to play matches. There was great excitement in Woodpeckers over the past week when we took on Owls in the 'Battle of the Bands' in TT Rockstars, however unfortunately we narrowly lost the first battle - luckily we got our revenge by thrashing them on the second battle!! We had a visitor in Science in the form of Mr.Webber from Henry Beaufort who spoke to us about the lungs and helped us to make models of them using balloons, straws, plastic cups and rubber gloves. We were fascinated to learn about how the diaphragm works and all the different functions of the lungs. In Maths we have been consolidating our knowledge on long multiplication before moving on to division. Our TT Rockstars work has certainly made a huge impact on how quickly we can solve problems . Our English lessons have seen us looking at more books nominated for The Hampshire Illustrated Book Award and writing information text based on some of the stories we have read. We have loved reading 'An Alphabet of stories' by Oliver Jeffers, and writing our own using alliteration. .On Friday we went to the Theatre Royal in Winchester where we saw the touring production of Private Peaceful by Michael Morpurgo. This was cleverly performed by only one man. Some of the children had not heard the story before and found it very poignant. Next week we will begin our rehearsals for our Christmas Carol concerts, we cant believe it has come around again so fast!!! Woodpeckers are continuing to read Pig Heart Boy in guided reading. Cameron, the main character, now has a new heart -from a pig! - and now he is back in school we are finding out how his friends are reacting, we are also watching the film about it. In our Art lessons we have made wire sculptures of our faces in the style of Alexander Calder. These were great fun to make but very fiddly! We have come to the end of our topic on Benin, where we have looked at all the evidence and written an account of whether the Benin Bronzes should be returned to Benin after being stolen by the Victorians. We, as a class, decided that the right thing to do would be to return them to Benin. We have a new unit in PE, which is a dance unit, and we are dancing to Michael Jackson's Thriller! It is great fun! In Maths, the Woodpeckers have been solving multi - step problems using addition and subtraction strategies and proving our answer by using the inverse operation. We have been showing our answer in different representations such as the cherry, bar and column method. The scores in our times tables have improved dramatically due to using the TT Rockstars programme, the children are enjoying challenging themselves and each other and receiving their weekly certificates. To round our English sessions off about World War 1, Year 5 visited Winchester Cathedral last Thursday to attend workshops and a service where we presented our wreath and the letters and poems we had written. We are now been listening to creation stories from different religions and countries and have included drama by acting some of them out. This morning we watched The Wizard of Oz, which was another fantastic production by M&M Theatre. In class, as our home story, have started to read Skycircus, the follow up book to Cogheart and Moonlocket by our friend Peter Bunzl. We are hoping it is as thrilling as the other two books have been! It has been a busy few weeks for Woodpeckers. Alongside our Maths lessons we have started practising our times tables using the TT Rockstars scheme which everyone seems to be really enjoying. Already, we are seeing the children's fluency scores and speed improving. Our class based Maths lessons have consolidated our knowledge on addition and subtraction using larger numbers and decimals to solve problems. In Science we have been learning about the heart and the blood vessels that surround it. We had a visit from a nurse who showed us how blood is taken and about inserting cannulas to help administer medicines directly into the blood. 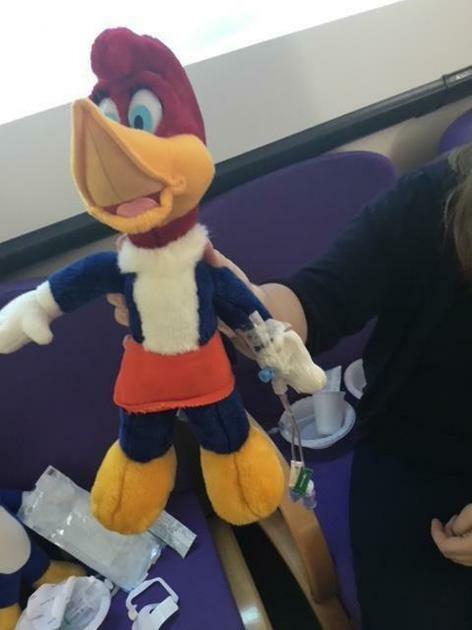 She even put a cannula into Winnie the woodpecker who did not resist!! Woodpeckers are becoming very imaginative in their Rhythmic Gym lessons using ribbons and hoops. We have had some very poignant English lessons based on 100 years of WW1, reading and writing letters to unknown soldiers, realising that the soldiers were not in fact unknown but someone's relative. We now use the 'Charanga' website for music and are learning Bon Jovi's 'Livin on a Prayer' using tuned and untuned percussion instruments ready to perform in our assembly. Woodpeckers have settled in well to the class routines after the long summer break. In our guided reading lessons we are studying the book 'Pig Heart Boy' by Malorie Blackman and predicting the outcome of main character's (Cameron) dilemma. English lessons have involved looking at the life and works of Michael Morpurgo and Philip Pullman and then writing our own biographies about the two authors, ensuring we have included all the necessary features. This week we have had two special days. On Wednesday it was RE day, where the children discovered what rites of passage were and then wrote their own, whilst on Thursday it was Roald Dahl day where they used their knowledge of biographies to write imaginary ones about about one of his book characters. In Maths at the beginning of the year, we have started with a baseline assessment to ascertain the children's ability. We have also been studying place value, using numbers up to ten million. Our topic this term is 'What impact did Europeans have on Benin?' and we have started to investigate this question. In Science we are learning at about the body and have started with the circulatory system and the components of blood. We have a new form of indoor P.E. in rhythmic gym. This is where we use hoops and balls in an interesting way in time to the music. Year 6 have done themselves proud in writing and performing their speeches for the House Captain vacancies and we have now elected our Year 6 House Captains for this year.